PORT Moresby is a city changing faster than at any other time we can recall. Driving around the six new roads that the Government built at a cost of K700 million, the Gerehu to Hanuabada ,Gerehu to 9 Mile , Gordons Industrial Roads Stage 2 ,Kookaburra ,Erima to 9 Mile and the Paga Hill ring road, you get a sense of what is being achieved and where things are headed. When the Government decided to fund these new roads some years back there were criticisms that there was an unfair distribution of infrastructure works benefiting the nation’s capital alone. 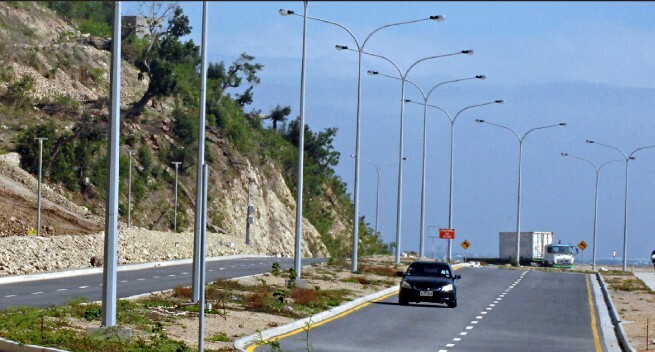 But as you drive along these completed roads today you will realise and appreciate that the decision was a right one in that Port Moresby is the Capital of PNG and the gateway to the rest of country. The road projects will ease traffic congestion and improve traffic flow, and give our capital a big facelift,’ said Prime Minister Peter O’Neill at that time. K400 million will come from the national budget while K300 million will be a soft loan from the EXIM Bank of China. David Conn, Chief Executive Officer of the Port Moresby Chamber of Commerce and Industry (POMCCI), says the improvements will prove as ‘a game changer’ for the city of Port Moresby, and will open up large tracts of the city for further development. One such major development is the Paga Hill Estate project which is expected to be ready to play a key role hosting the Leaders’ meeting at the APEC Summit in Port Moresby in 2018. The Paga Hill area had been a squatter settlement since the mid-1990s, when a National Housing Corporation site was decommissioned. In May 2012, the company behind the project, Paga Hill Development Company, attracted controversy when it began evicting squatters’, prompting an injunction.